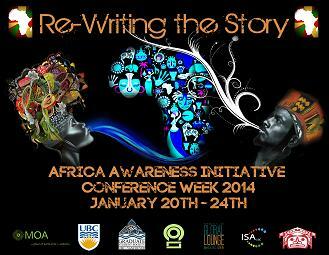 In case you missed it, next week marks the return of the UBC Africa Awareness Initiative (AAI) Conference Week for 2014 (Jan. 20-24). Since 2002, this annual UBC student-run organization “aim[s] to continually produce outstanding academic forums to encourage critical discussions pertaining to the relevance of the African continent, the Diaspora and its increasing involvement in the global community”. For 2013/2014, the AAI has four new initiatives in addition to its annual conference. Learn more about these initiatives and the conference at: http://aaiconferenceweek2014.org/about-aai-2/. Celebrate the UBC AAI conference week by visiting the Africa Awareness Initiative community in cIRcle at: https://circle.ubc.ca/handle/2429/44019. The top three items in the Africa Awareness Initiative community in cIRcle have been accessed and/or downloaded from Australia, Canada, China, France, Ghana, India, Iran, Japan, Kenya, Pakistan, South Africa, Tanzania, Turkey, Uganda, Ukraine, United Kingdom, United State, and others: A case study of rural water supply in Kenya; Language education policy and multilingual literacies in Ugandan primary schools; and, Everyday life information seeking behaviour of urban homeless youth.